It’s been a week of as many changes off the pitch as we expected following the exodus of managers in the closing few weeks and immediately after the conclusion of the Torneo Apertura. Julio César Falcioni took charge at Boca Juniors, who have now trained their sights on his former Banfield charge Walter Erviti; former River Plate boss Ángel Cappa became the new manager of Gimnasia La Plata, with a brief to avoid relegation; Tigre remain managerless, but Vélez Sarsfield boss Ricardo Gareca has decided to stay. And Omar Asad, who walked out on Godoy Cruz late last week, has taken a job in Ecuador. Ricardo Caruso Lombardi left Tigre on the 15th, as he’d said he would following the allegations from Juan Angulo Villegas a few weeks ago that the manager had asked for money in return for playing time. The club are without a manager still for the moment, but a lot of that comes down to politics; the elections for the new presidency are being held on Sunday the 26th December, and the outcome of those will shape both the manager brought in and transfer policy over the summer. Cappa arrived in Gimnasia with the Promedio a serious worry for the country’s oldest club, and has been charged with keeping them in the top flight. Fans who watched his tenure at River turn from promising to wearisome, and wondered at his complete blindness to the situation (trying to play pretty football is all well and good, but doing it at the expense of results when in a relegation fight?) 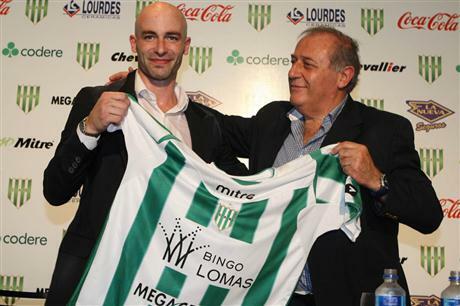 might have blanched a little at his announcement that, ‘with me, this club have chosen a particular idea about how football should be played.’ It’s an idea of football, of course, which he would claim is diametrically opposed to Gimnasia’s city rivals Estudiantes, of whom he said in the press conference, ‘I don’t have anything against them… but nor do I have anything in their favour.’ Cappa has also said he’ll only claim a bonus from Gimnasia if he wins the league title. That’s something Gimnasia have never done in their history – and nor has Cappa in his career. In La Boca, Julio César Falcioni’s unveiling after a few weeks of courting has of course been the biggest talking point in the country’s football. Falcioni has already set about outlining his vision for a new Boca, one in which – as Dan Edwards suggested in the most recent episode of Hand Of Pod – Walter Erviti, coming off the back of a fantastic season at Falcioni’s Banfield, could be set to be the main playmaker initially, playing alongside Juan Román Riquelme if and when the great man returns from injury. Darío Cvitanich, who also played for Banfield under Falcioni before moving on to Ajax (he’s now in Mexico with Pachuca) is another potential target. Erviti claims he’s ‘enjoyed and been comfortable at Banfield, but I’d like to be at a club which is competing for things.’ So why move from Banfield to Boca, Walter?! And finally to Ecuador, where Omar Asad has taken charge of Emelec after leaving Godoy Cruz last week in a dispute over pay (he felt he deserved a pay rise, as the manager who’s led them into the Copa Libertadores for the first time ever; the directors, a little strangely, disagreed strongly enough that Asad felt compelled to quit). Emelec have just finished runners-up in the Ecuadorian championship under Jorge Sampaoli, another Argentine manager, who’s left to take charge of Universidad de Chile. Asad hasn’t actually signed on the dotted line yet, but both manager and club have made clear that’s all that remains to be done. Asad has been replaced at Godoy by Uruguayan Jorge Da Silva, a former Uruguay international as well as a former Atlético de Madrid and River Plate player in the 1980s, whose most recent coaching job was at Al Nasr in Saudi Arabia. America of Mexico apparently uninterested in Buonanotte. Benfica offering River $8.5 euros for Funes Mori. Ignacio Scocco interested in leaving Greece to play for River. Boca pursueing Velez’s midfielder Leandro Somoza. Boca interested in snatching Oscar Ustari from Getafe. Boca still showing interest in Walter Erviti, as well as Dario Cvitanich. And the worse news is that apparently Andy D has been told by Inter of Porto Alegre that he can pursue work elsewhere. I would guess “elsewhere” could very well end up being River Plate. Ouch. I note that Benfica is not offering $8.5 euros for Funes Mori but $8.5 million euros, though my initial post is probably a bit of a Freudian slip.